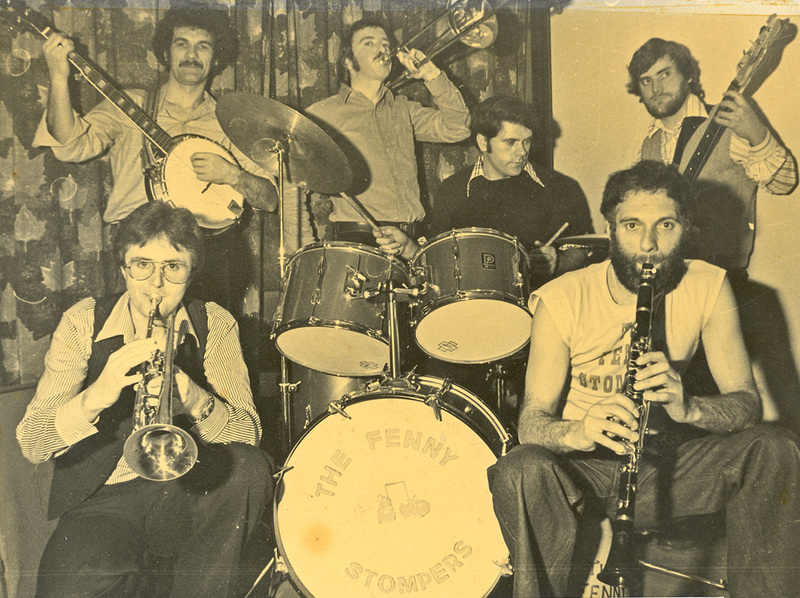 The Fenny Stompers have been entertaining audiences near and far for well over 30 years. The line-up has changed many times but the band is still led by its founder, Dennis Vick. 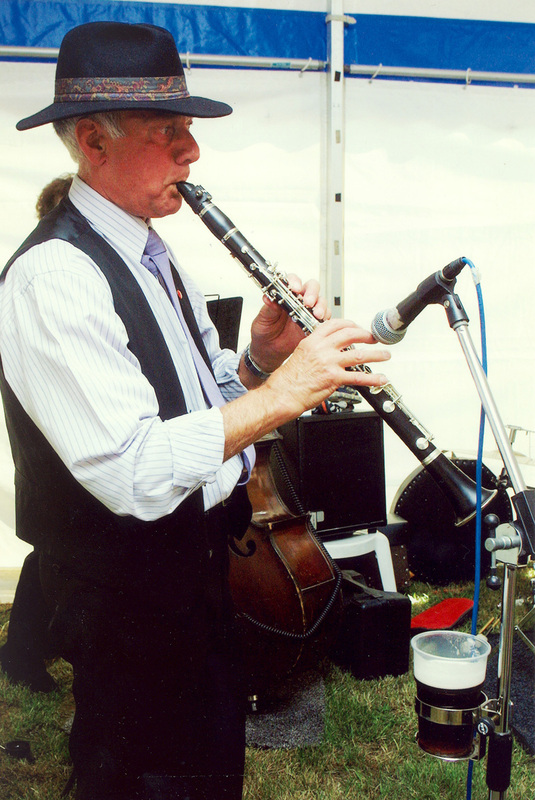 Dennis grew up in Fenny Stratford and started listening to Trad, Dixieland and New Orleans jazz in clubs during the late 1950s. His interest developed and, after running buses to all-night venues in Aylesbury, he and others thought it would be a good idea to have a jazz club in Bletchley. This started in the King’s Head, once a week, later moving to The Bull Hotel. Like many clubs, however, it struggled and finally had to close. In 1973, Dennis bought a clarinet. He remembers, ‘I found a teacher by the name of Terry Marshall (of Marshall Amplification) …I had lessons for two years and he put me on the right track.’ He then persuaded his brother, Brian, to buy a banjo and found a friend at work, Frank O’Sullivan, who wanted to play trumpet so the nucleus of a band emerged. Tad Newton (trombone, Colin Davis, (bass) and Leo Armitage (drums) completed the original line-up. In 1977 they were asked to play at a senior citizens Christmas party at Bletchley Leisure Centre – they needed a name and plumped for Red River Stompers. 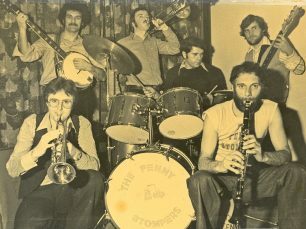 Then Dennis’ wife suggested that as he was born in Fenny Stratford, why not call the band The Fenny Stompers Jazzband. The rest is history. Their first official gig with their new name was at the Bull Hotel in Fenny on Friday, May 20th 1978 – their fee was £30 plus beer! The landlord was so pleased with the event he booked the band for three more gigs. They later moved across the road to the Swan Hotel and ran Sunday lunchtime jazz sessions, bringing in other bands on alternate weeks. In 1981 they did their first recording for CRMK and then appeared on both BBC and Anglia TV. Over thirty-three years on, the band’s scrapbook is full of great memories with photos, press cuttings and gig tickets. Concerts, parties, charity events and even funerals – they’re as popular as ever. And the whole thing is about enjoyment – of playing and of entertaining audiences. As Denis says, ‘I’ve been playing clarinet for over 37 years and still get pleasure out of playing gigs once or twice a week.’ By 2010 the line-up became: Denis Vick (clarinet/sax), Brian Vick (banjo/guitar), Dave Arnold (drums), Gordon Rushden (trombone), Margaret Thompson (double bass) and Dave Marchant (trumpet). Keep Music Live! Did the Stompers used to play in the Green Man on Mondays? I am President of Bedford Lions Club and chose the Fenny Stompers to play at our 49th Charter Dinner on February 25th 2017 and celebrate 100 years of Lions Clubs International which began on June 7th 1917 founded by Melvin Jones in Chicago. The band had played for us before and will definitely do so again as they are very professional, friendly and fun jazz players. I highly recommend them and they have a great local following which means that when we book them for a fundraising event we gain a large audience and therefore raise an excellent amount for local charities and individual good causes. Thanks for a great evening Dennis and your fellow bandsmen.